Hi my name is Julie and I’ve had my dog Zoie for 12 years ever since she was a puppy. I love her as my child. We moved to North Carolina from Florida 2 years ago and I can see that Julie was having difficulty getting up and down the stairs it was like she didn’t even want to try. We took her to the vet and they gave her all kinds of strong pain meds and joint prescription that were supposed to help but reading all of the side effects I more side effects then actual helping properties. 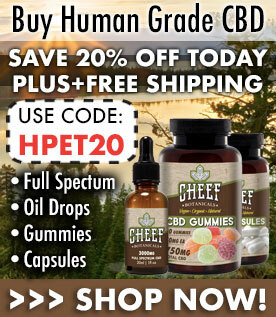 I then was looking for a more natural treatment so I searched online and not knowing of CBD or what it did I stumbled upon Holistapet and read other reviews so I started to give them a try. I ordered 1 package of 30 dog treats, followed the dosing recommendations and it only took 1 week to start seeing the improvements. 2 weeks later she was running all over outside and up and down the stairs she went! Julie was happy again and so was I. Please note that in addition to trying holistapet I did decide to change her diet (as recommended by them) to have more fruits and vegtables including no caged or factory raised meats no dairy and no processed grains. Anyway my dog is doing great and I have you guys to thank so THANK YOU!! !